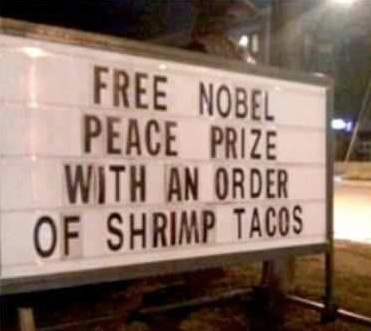 The Nobel Peace Prize Went to What?? I’ve been away from the site most of the day because it’s taken all day to wipe up the snorted coffee all over my desk from the news that the European Union has won the Nobel Peace Prize. Is today April Fools Day and nobody told me? Move over, UNICEF. Make some room, Pugwash Conference, United Nations and IPCC. American Friends Service Committee, Doctors Without Borders, and International Committee of the Red Cross, you have a new colleague. The European Union is joining the ranks of organizations awarded the world’s most sententious and self-regarding accolade, the Nobel Peace Prize. . . The Europeans have made a bigger hash of their social insurance policies than we have, their immigration policy is a time bomb, their ideas about foreign policy and power are laughable, and their monetary incompetence will be held up to the wonder and scorn of future generations for centuries to come. They are almost as incompetent at constitution making as they are at currency organization. For generations EU leaders have boastfully compared themselves to the American founders; for generations they have failed to build an effective polity. Each new constitutional or treaty initiative creates a bigger mess: more inconsequential, ill-defined bureaucracies and legislative bodies, less public support, less effectiveness and transparency in governance. No part of the world is more narcissistic than Europe. No one sings “We are the World” with more assurance and less doubt. I’m glad Walter has saved me the trouble of hooting and jeering this ridiculous pick. Of course, the Nobel Peace Prize has been so debased by its recent winners (Al Gore, Jimmy Carter, Barack Obama. . .) that maybe I’ve missed the real genius here, which is that the pick is meant to heap ridicule on Brussels. I guarantee the Eurocrats won’t get the joke. But it’s sure giving me a great laugh. It's about this easy. . .